The University recommends that qualified students complete part of their coursework studying abroad. Four- and five-year students may spend one semester of their third year and two-year students may spend one semester of their second year studying abroad. Cairn requires that a student have a minimum grade point average of 2.50 to participate. To facilitate studying abroad, Cairn has affiliations with six organizations: AMBEX, BestSemester, GO ED., Jerusalem University College, Rome with Purpose, and Veritas Christian Study Abroad. Specific program information can be obtained through their websites. 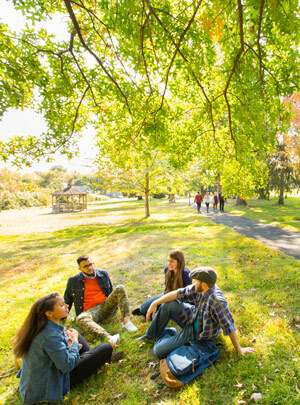 Although students are not on the Langhorne campus while participating in these study abroad programs, they are nevertheless fully matriculated Cairn students. AMBEX (ambex.org) is a Christian study abroad program in Europe. Located in Regensburg, Germany, AMBEX emphasizes church history, theology, philosophy, spiritual growth, and missions. Academic guided tours in Germany, Austria, and Italy are included. BestSemester (bestsemester.com) is the study abroad program of the Council for Christian Colleges and Universities, of which Cairn is an affiliate member. BestSemester includes a total of eleven different semester programs and one summer program. Students can study internationally in Australia, China, India, Latin America, Uganda, Oxford, or the Middle East. BestSemester also has four programs in the United States. GO ED. (go-ed.org) embeds college and university students in select regions and countries to learn, study, and experience life from an indigenous perspective. GO ED operates in some of the most poverty-stricken regions of the world, firm in their belief that light, beauty, and hope continue to thrive in these hard places, and that they offer profound lessons to those who are willing to learn. Jerusalem University College (juc.edu), located on Mt. Zion in Jerusalem, provides unique settings for study. Living and studying in the land where biblical events actually took place inevitably deepens students’ understanding of the Scriptures and increases their ability to communicate its message. The faculty strives to cultivate an enriched understanding of the Christian faith through a firsthand encounter with the land, including language, history, and culture. All courses at JUC are taught in English. The curriculum offerings are in the areas of biblical studies, archaeology, language, history, and sociology. Rome with Purpose (romewithpurpose.com) allows students to experience Italy in Christian community. Courses are offered in the areas of history, art, culture, and humanities. Veritas Christian Study Abroad (veritasabroad.com) emphasizes international ministry with study abroad locations in Africa, Asia, Europe, and Latin America. The cost for these study abroad programs varies depending on the program and location chosen. To cover the possibility of urgent medical needs, Cairn requires that each student acquire travel insurance through the University’s insurance provider. The cost for this insurance will be added to the student’s billing account. Financial aid in the form of state and federal grants and student loans can be used toward Cairn’s study abroad programs. In addition, ten students per year may use Cairn-based aid toward a study abroad program. Students interested in a study abroad program must complete a Cairn study abroad application prior to applying to the program. Credits and grades earned through study abroad appear on the student’s Cairn transcript and are included in the grade point average. The actual number of study abroad credits applicable toward graduation is contingent upon the student’s program. Since study abroad classes are not identical with those offered by the University, credit is granted for selected biblical, arts and sciences, or professional courses required in the student’s curriculum. The following Cairn requirements may be waived in lieu of study abroad credits. The registrar selects the appropriate credits in the student’s curriculum.